Lambeth Cyclists, the local Borough group of the London Cycling Campaign, will next week hold a sustainable transport hustings meeting. At the meeting the cyclists will be questioning the parties standing for Lambeth Council over their policies on sustainable transport. They will also be asking the representatives to sign up to a ‘manifesto’ of polices all aimed at making Lambeth becomes a truly cycle friendly borough. The Lambeth Cyclists sustainable transport hustings will take place at the Stockwell Community Resource Centre, 1 Studley Road, Stockwell SW4 (behind Stockwell tube station) on Tuesday 20 April starting at 7:30pm. Working with London Cycling Campaign head office and following consultation with LCC members in Lambeth we have prepared a manifesto for cycling in Lambeth. These are the measures that we think will make Lambeth a more cycle friendly borough. · Back an investment plan that will achieve a cycle use target of 20% of all journeys under five miles in the borough by 2031. · Reduce danger by setting a 20mph default speed limit in built up areas. · Work with the Mayor of London to improve cycle safety on red routes controlled by Transport for London. · Encourage Lambeth businesses to extend cycle awareness training to all staff. · Continue the successful policy of offering on-road cycling training for all school children and subsidised training on demand for all adults living and working in the borough. · Encourage parents and guardians to cycle and walk with their children to school. · Encourage healthy living by maintaining and improving the current programme of cycle promotion and consider new initiatives such as car free Sundays. 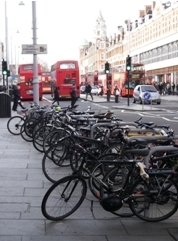 · Encourage Lambeth businesses and organisations to offer sufficient cycle parking for all staff. Start by ensuring that all Council buildings and schools offer this facility. · Ensure that adequate cycle parking is provided across the borough at shopping, leisure and other public facilities. · Ensure that all developments of residential premises include secure cycle parking within the home for all residents. · Extend the successful policy of training front line Council staff in cycle awareness to transport planners, highway engineers and others whose actions have an impact on cyclists on the ground. · Make local cycle journeys easier by reallocating highway space to cycling, by for example, making one way streets two-way for cyclists and removing through routes for motor traffic. · Continue investment in the London Cycle Network and ensure that the cycle lanes provided meet the needs of cyclists. 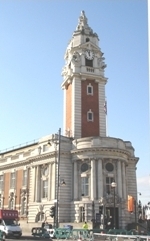 · Consider introducing a Controlled Parking Zone for all streets across the borough to reduce traffic and congestion. · Encourage Lambeth Borough Council staff to cycle by signing up to the Government’s Cycle to Work guarantee scheme and providing cycle mileage allowances equal to car mileage allowances. Ensure that this scheme is regularly publicised to all staff. On Tuesday 13 April 2010 we will be giving out croissants and coffee and offering a Dr Bike service to cyclists between 8 and 9am on Brixton Road. The event will be held at the front of 336 Brixton Road, SW9, do call in if you are passing to adjust your bike and stop off for a coffee! If you would like to volunteer to help please contact Philip Loy. If you didn’t know by now Thursday 6 May is election day with the General Election. Of more importance perhaps to us as cyclists in Lambeth are the borough council elections being held across London, including Lambeth, that day. Cycling in Lambeth has increased greatly over the past 10 years and we are fortunate that cycling has received support from administrations of all parties on the council. Measures such as low price cycle training, promotion in schools, installation of cycle parking facilities and the development of cycle routes in the borough have made a real difference and led to more and more people using their bikes. And yet cycling still is a minority form of transport too often thought of as the preserve of fast commuter cyclists and not for most Lambeth residents. How can we change this? What policies do the parties standing for election propose to get more people cycling around Lambeth? Come and find out at the Lambeth Cyclists Husting Meeting on Tuesday 20 April 2010. The hustings meeting will be a question time style event with representatives from the parties on the council outlining their approaches to cycling and wider transport policy and answering questions from Lambeth Cyclists members. A large turnout will show that cyclists matter – as residents of the borough and as voters – and allow us to build relationships with the leading politicians of all parties on Lambeth Borough Council. We have prepared a manifesto for cycling in Lambeth - see over for our main demands (a fuller version is on the website).